Home » Oh No! Don't use Edge! Oh No! Don’t use Edge! Oh No! You’re trying to use Edge as your Internet browser! Please close Edge and use IE for sharepoint instead. Feel free to use Chrome for everything else. Why? Microsoft Edge is Microsoft’s new internet browser in Windows 10, but unfortunately, it has all sorts of issues with sharepoint sites, so Microsoft recommends using Internet Explorer instead. If you think it’s strange that you need to use their old internet browser to work correctly with their own products, you are not alone. 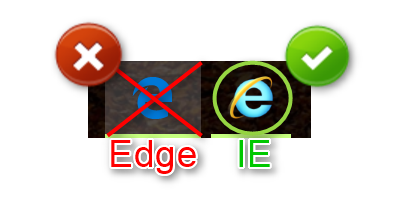 To further complicate matters, the logos for IE and Edge look very similar. You want to use IE. We’d also recommend removing the Edge icon in your taskbar and pinning IE instead. Pin IE: Type IE in the search box in the taskbar, right click, select pin to taskbar. Feel free to call IT at x506 if you’re having trouble.